The biggest fear we all have when we’re eating out? Finding unwanted foreign objects in the food we’re eating! This bad nightmare allegedly came true for a woman in China when she found sanitary napkins in her food two times in the short time period of two days. The woman, identified by her surname Ni, allegedly pulled out a paper from her meal that looked like a sanitary napkin. 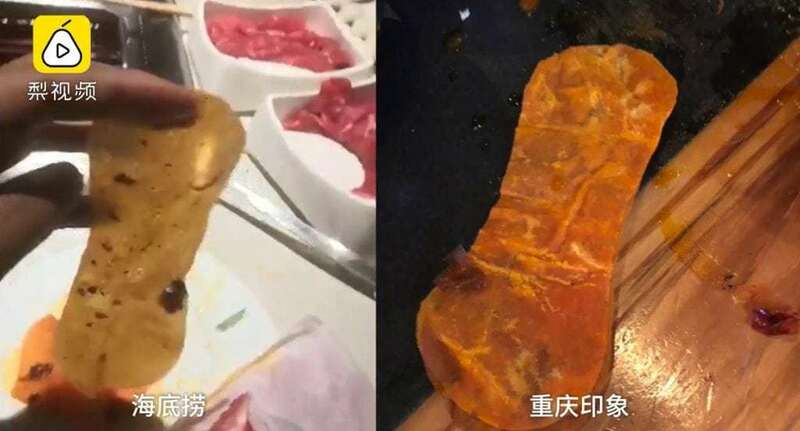 Haidilao, the hot pot restaurant with multiple outlets all over China, explained to her that it was a paper that is used for wrapping the meat. Ni, however, did not accept the explanation and posted photos of the object she found along with the wrapping paper that Haidilao uses. She said it was clear that what she found was a sanitary napkin and she demanded compensation for it a million yuan (Rs 1,06,70,000). The chain eventually agreed to give Ni a refund for her meal and the matter would have ended there but the boss of another restaurant also called up the police to inform them about having received the same complaint from the same woman just two days after the first one. The manager of the second restaurant said she reported finding a sanitary napkin in her food while eating at the restaurant and asked for compensation. Ni, however, said that this wasn’t the case and she just wanted to raise awareness about the unhygienic conditions. China has had a long history of such stories and no one can know the truth about this one either. However, if it did happen, we hope the woman finds some relief and justice.